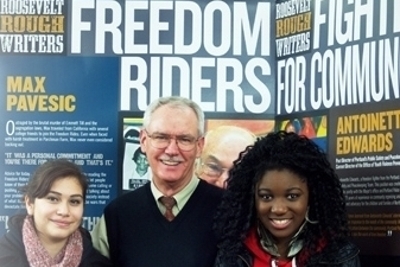 Local and civic history came alive at Roosevelt High School in November 2012 as ninety students enrolled in George Bishop and Shawn Swanson's freshman Humanities course interviewed sixteen community Freedom Fighters who have taken a stand for social justice. In hearing these stories, the students learned how leaders from their communities have worked tirelessly to advance the civil rights of various races, cultures and religions. Later, as they wrote in response to these stories, the Roosevelt students strengthened their writing skills, enhanced their appreciation of history, and invigorated their sense of community pride. Assisted by University of Portland School of Education students, the Roosevelt freshmen eventually used their interviews to create two products: a museum-quality traveling exhibit and a publication that features the writing the students' writing and documents the stories of their interviewees. The exhibit will travel alongside a national Frederick Douglass exhibit and travel throughout Portland and Multnomah County during February 2013. Roosevelt students will develop presentation skills as they serve as exhibit docents at numerous community locations including area colleges and universities, the Oregon Historic Society and Mt. Olivet Baptist Church. The University of Portland will host the exhibit on February 19 and 20 in the Franz Hall Foyer. Fourteen members of Dr. Rich Christen's Social Studies methods course assisted in the Freedom Fighters project at Roosevelt High School, Roosevelt High School, which is the most ethnically diverse school in Multnomah County and serves a high percentage of low-income students. A mixture of MAT students and professional-year undergraduates, the UP students helped Roosevelt students conduct the interviews. They also guided them in the process of creating written and visual work for an exhibition.